I know that the stuff I sell in my Second Life store is often inspired by my real life, and today’s new releases are no exception. Even though the weather in Europe has been rather gloomy and cool, my tomato plants are doing well. I check on them every morning, coffee in hand, inspecting the size of the little green blobs and drooling at the thought of toasted tomato sandwiches, salads with grilled tomatoes, and yes, fried green tomatoes with our Sunday morning bacon and eggs. Yumm! My better half offered up the name for our cute Bagged Tomato plant – and on hearing it, I instantly agreed. A juicy, shiny, perfectly ripe tomato hangs from a non-tomato vine, begging to be harvested. Planted in a vertical bag planter, it will hardly take up any room and is a cute edible decor item that can be attached to a garden or house wall, or a fence. Or how about growing it inside, right in your kitchen? Eight prims, including shadows and copy, modify permissions as always with our products. I am a nature girl from way back, so camping and hanging around outside is my thing. 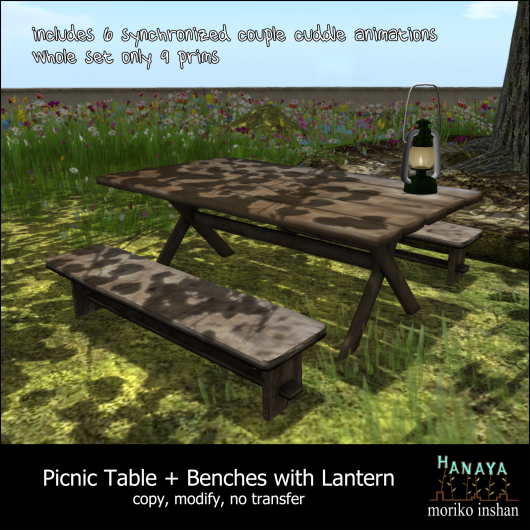 The -Hanaya- Picnic Table comes with 2 benches, and contains 6 synchronized couple cuddle animations (3 for guys and 3 for girls). The animations are fully adjustable and are menu-driven. The camp lantern adds a bit of gentle light on summer evenings. The Bagged Tomato and Picnic Table set are on display on the main floor of our in-world store, where they are available for purchase. Or if you prefer, buy in our web store on the Second Life Marketplace. We are thrilled to announce that we are once again participating in Vintage Fair 2012. Lots of new stuff is currently in progress in our workshop and we can’t wait to show it to you guys! The Vintage Fair starts on August 2nd (my real life birthday), and ends of August 29th. It promises to be a wonderful event, so please stay tuned for more information. If you have stopped by our in-world store lately, you will have been greeted with a message about … ‘we are under construction, please excuse the mess’. The mess is not over yet, but progress is being made. Big thank you goes to my brother-in-law, Lance Corrimal, for scripting the system. The customer service area on the main floor is currently being re-worked as well – to make room for our redelivery terminal and gift card system (coming soon I hope), and to tidy it up. We have also added lots of new plant life to decorate the gardens – look especially for the wonderfully detailed dragon flies near the creek. Thanks for reading and have a happy weekend! * Please note the shadows in the Picnic Table product image above are client-side. This entry was posted in Events, News, Product Announcements and tagged new product, Vintage Fair 2012 on July 13, 2012 by moriko. My Second Life family and I have become kind of horse-crazy lately, so I decided to make a little horsie friend for everyone to enjoy. Our little wannabe horse consists of a mesh/sculptie body and head, with an English saddle. The beautifully detailed saddle comes equipped with 3 riding poses – just right for taking some cute pics. And the little horsie head is primaliciously kissable. Lacking prims? No problem – you can use the wearable version of the saddle and a stripped down version of the horse, which is also included – only 1 prim. 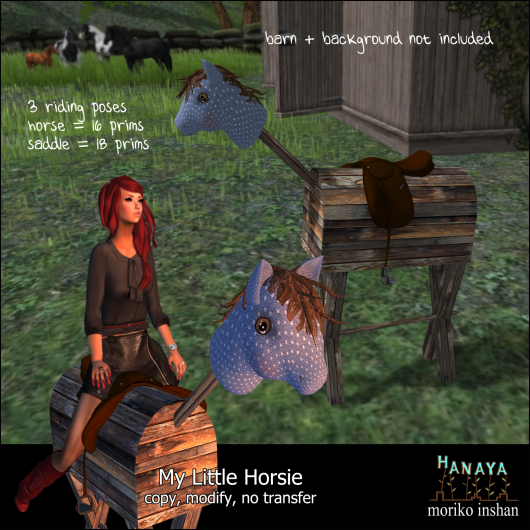 My Little Horsie was sent out to -Hanaya- Yummy Collectibles in-world group members today. If you missed yours, it is also available in the Customer Information area of our in-world store, where it will remain up for grabs for the month of July. Please note that the group join fee is 250 L.
Have a great week, and make sure you give your little horsie some exercise! My Little Horsie is now available for general purchase at our in-world store and on the Second Life Marketplace. 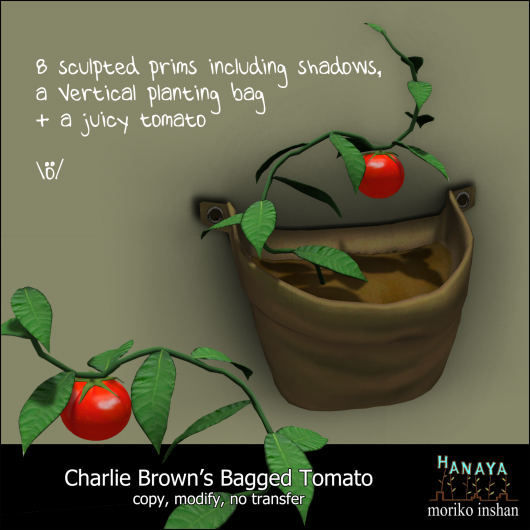 This entry was posted in Freebies and Gifts, Product Announcements on July 3, 2012 by moriko.